Looking for a lower-carb side dish? This festive salad is easy to put together and makes for a light, yet tasty side on Thanksgiving - or any other day of the month! In a small bowl, whisk dressing ingredients. 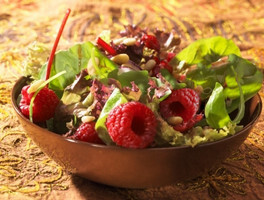 In a medium salad bowl, toss together salad ingredients. Drizzle dressing over salad and toss gently to coat.